Our oldest son and his wife have been married five years. People always think they have the right to ask couples the most personal of questions, i.e. "When are you going to have a baby?" The subject was not brought up by them, so we respected their privacy and didn't mention it either. However, I did realize I had a problem when I began stalking cute babies in church, offering to their parents to hold them, change them, babysit for them. When Michael and Tifany returned from their most recent vacation they invited her parents and us over for brunch. They had been to Napa Valley and presented each of us couples with a gift box that looked like a bottle of some kind. As I looked at the label on the bottle of Mumm sparkling wine I realized it had been altered to read..."Tifany is going to be a MUMM and Michael is going to be a POPP". OK, I didn't see it right away. Her parents were crying and I was thinking, well this is a nice bottle of wine, but isn't that a little over the top, when Michael said "Read the label, Mom, read the label!" A blond grandma moment. So now I'm thinking about getting rid of my Sebring convertible and, horrors, buying a minivan. The spare bedroom will be repainted and turned into a nursery and I'm starting to haunt garage sales again for baby accessories. And there is another little soul added to my daily prayer requests. Every day one gets so many e-mails from acquaintances and friends that sometimes it gets a bit overwhelming. Don't get me wrong - I'm thankful to have friends that think of me at all, even if it is to be included in a batch list of people I probably will never meet. The problem is that I feel guilty if we delete them without reading them, as if anyone knew or even cared. Are there special rules of e-mail etiquette? There was a 92 year old woman who was legally blind. In spite of her limitation, she was always neatly dressed, with her hair carefully brushed and her makeup tastefully applied. 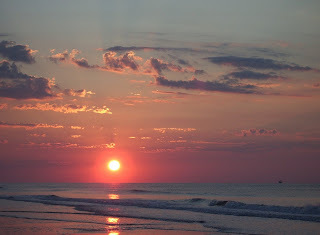 Each morning she would meet the new day with eagerness. When an attendant finally came for her, she smiled sweetly as she maneuvered the walker to the elevator. The staff member described her room to her, including the curtains that had been hung on the windows. "I love it," she declared. "But Mrs. Jones, you haven't seen your room yet," the attendant replied. "That doesn't have anything to do with it," she said. "Happiness is something you choose. Whether I like my room or not doesn't depend on how it's arranged. It's how I arrange my mind." I will be like that when I am old, if I practice that level of gratitude and optimism now. Do I meet each day with eagerness? Am I patient when I am kept waiting or I sigh and look at the receptionist anxiously to see whether I have been forgotten in the doctor's/dentist offices? Maybe I'd better start practicing. I couldn't cry at her funeral. Her decline and eventual passing had been so traumatic I was numb at the funeral home. But when I took Chewy to the vet for his final visit, I lost it. I thought they were going to call 911. All the pent-up emotions of the last months poured out of me. We wanted to take our time before immediately replacing Toonses and Chewy. A few months went by and the house seemed so lonely without them, especially when we would return from work to an empty house. Our cats were always standing at the door to greet us. 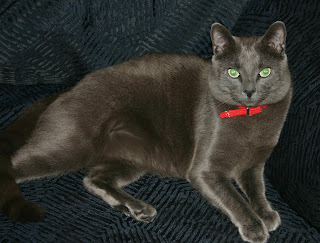 I had read up on cat breeds and decided perhaps our next cats would be a Russian Blue mix, because their temperament was supposed to be good for small children. I wanted two male cats, preferably brothers, which had been neutered and declawed. I found a website called Petfinders.com and entered in the specifics we were looking for. Lo and behold, there was a shelter in Toronto, Canada that had exactly what we were looking for. We took a day off from work and drove to Toronto to visit with them. They were both very friendly and affectionate and we decided to adopt them. 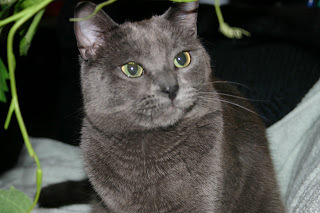 They were 1-1/2 year old Russian Blue mix brothers, declawed and neutered, named Elvis and Buddy. Buddy meowed for at least two hours on the way home. I just kept feeding little bits of cat food. But once we got home they settled in at once and by the end of the evening were lying on top of us and we all watched TV together. After a day or two I asked Georg if he was happy we got the new cats. He said "Yes, kind of". I asked what he meant and he said that in a way he felt disloyal to Toonses and Chewy by giving his heart away again so soon. As soon as he said it, he was able to let go. Elvis and Buddy are now Sasha and Yuri. They adjusted to their new names immediately. We love having cats in the house again and hope to have them with us at least another 16 years. 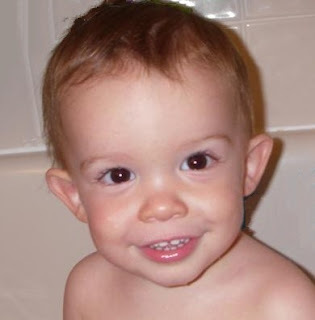 *A footnote: As I was filing their paperwork, I looked at it more closely and realized that they had been born on EXACTLY the same day as our grandson - 10-14-04!